This is for a custom 4 inch wide name patch. 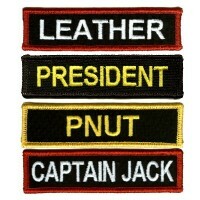 The height of this name patch can be 1 inch or 1.5 inches. You can choose the height in the drop down box. If you need several name patches that are the same color(s), you can type the names in the name box...separate the names by using a (;) semicolon. The drop down box will show the price breaks. If you choose the OLD ENGLISH font, we will do upper and lower case lettering. It will not look good in all upper case. There is no minimum order QTY for this patch. You may order them 1 at a time if you like.